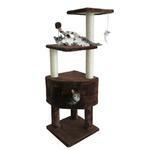 The FurHaven Tiger Tough Cat Clubhouse Playground cat tree tower is the purr-fact combination of privacy and play. 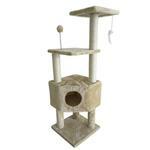 The FurHaven Tiger Tough Cat Clubhouse features a generously-sized 15" x 15" corner-style cat house condo, your cat or kitten will enjoy exploring the multiple climbing platforms or simply hiding away for the day in their spacious retreat. It includes features great for scratching, playing, and relaxing! Easily assembled and works great in the corner of any room. It is difficult to find nice harnesses or clothes for a little dog and your variety and quality is the best! And I have moved from harnesses, to clothes to toys! All great.